"I hope these are a couple of unpleasant hours for you." - Swanee Hunt, former US Ambassador to Austria and Founding Director of the Women and Public Policy Program at Harvard, as she introduced the film "Playground" to a large audience at Suffolk Law School on February 17. Unpleasant indeed. Unpleasant and then some is more like it. How else do you describe a 2 hour film that lays bare the reality of sexual slavery in the United States, taking you through the stories of young girls who could very well be your neighbor, you friend, your sister, or you? That is exactly what the film 'Playground' - by filmaker Libby Spears, produced by George Clooney, Stephen Soderbergh, and Grant Heslov, does. 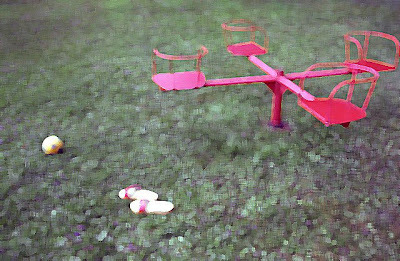 Coming from a point where trafficking in the media tends to be sensationalized in all the wrong ways [see: Taken], Playground is a welcomed change, addressing the issue in a creative, compelling, and very real way. Whereas we usually see documentaries from Cambodia or Thailand or anywhere else we can label as 'over there' to make us feel better, or we see CIA agents valiantly struggling to save their innocent daughter inside the US, Playground gives us a glimpse of the often overlooked reality of the enslavement of girls inside the US - girls born and raised here, girls that could very well be the girl next door. Mixed in with the stories of several victims (all with a different background, thus effectively tossing the notion that such things happen only to 'certain types' of girls), are startling statistics and facts, and interviews with some of the people who are taking the lead in fighting this insidious crime. There is a lot to digest, and in the coming weeks I will be posting my thoughts and reactions to many of the issues raised. Rather than give you a complete summary though, I encourage you to see the film on your own and then hopefully discuss it with your friends and community, and come back here to discuss it with us and others in the comments section. Do you know if there is any way to get ahold of a copy of this movie? I'd like to see it and possibly set up a viewing of it in my community. Please let me know. I did some browsing and I didn't really find any details on how to set up a screening. I'm sure if you go to the link in the article or email info@nestfoundation.org someone will be able to answer that question. If you find out come back and let us know - especially if you plan to set up a viewing so we can publicize it. I commend this effort to raise awareness of human trafficking. I work in the area of mitigating child labor and human trafficking, as well as returning or preparing former child laborers and ex child combatants to educational interventions, so I am aware of how difficult it can be to raise awareness, in your own backyard and globally. My book, The Sudan Curse, touches briefly on this issue, but it's definitely an issue for wider support.